IFS recent customer conference showcased a company that its long on technology but thankfully short on hubris. In this first report, I look at the broad sweep of change IFS is seeing. 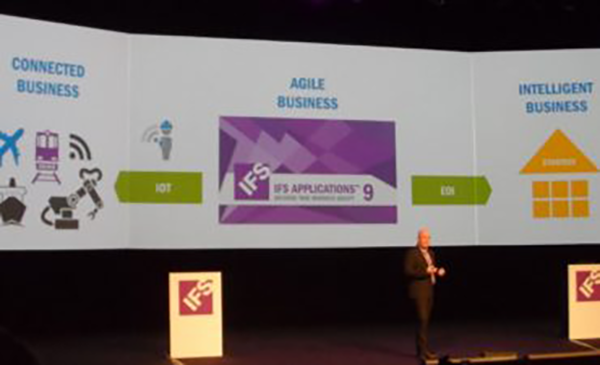 Scandinavian ERP software vendor IFS (Industrial and Financial Systems) recently held its user and partner conference in Gothenburg, Sweden. The general mood of management, customers, partners and its private equity investor was positive. I estimate that 1,200 or so people attended this event of which a record 240 were partners. IFS is an ERP vendor with a focus on several asset intensive or service focused verticals such as aerospace & defense, oil & gas and automotive. Clients include firms such as SAAB Technology, NEC and SKANKSA. The company’s roots are in Sweden but it makes a significant number of its sales in the United States and Western Europe – particularly to mid-market firms. Its ERP suite covers many of the financial, supply chain and production modules needed for discrete and process manufacturing. IFS also possess enterprise asset management (EAM), project management and supply chain management functionality. I am aware of them being considered in software selections of asset-intensive firms in the United States. Competitors to IFS would include Infor, Plex, Rootstock, Oracle/JD Edwards and numerous Microsoft partner solutions built around the Dynamics product lines. Much of the solution is organically grown. One major component, the EOI toolset discussed in the third part of this series, was acquired from VisionWaves in July, 2015. This acquisition brings visualization, process and value chain visibility to the IFS suite. The current IFS product suite can be acquired on-premises or via a hosted managed services. 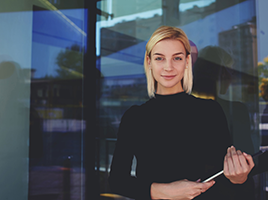 Two application areas, the Mobile Workforce Management and Field Service Management applications can be delivered as multi-tenant cloud offerings via Microsoft Azure. The overarching focus for the company, for now, is to continue to enhance customer productivity. To that end, a lot of discussion at the conference involved the use of sensor data to reduce unplanned machine downtime, improve worker productivity and increase revenues. 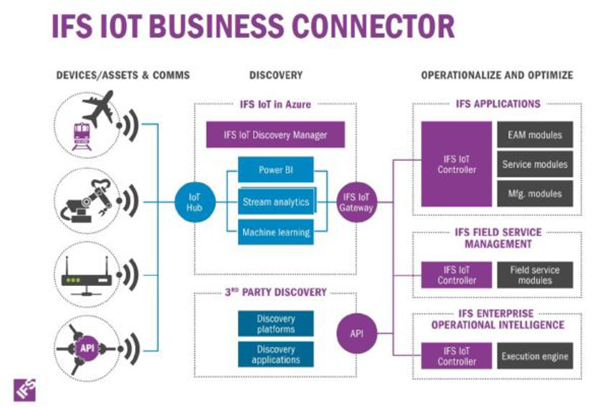 IFS wants to help manufacturers move to the digital age – more specifically they announced tools to expedite Industrial Internet of Things (IoT) initiatives. IFS has materially upgraded a solution it bought last year that provides powerful integration, process management/visibility, controls and dashboards to customers. IFS has connected all of the above to their most current release of its solution set: version 9. Additionally, the company has a technology partnership with Microsoft that brings new machine learning, business intelligence, managed cloud services and more to the mix. Their style is matter-of-fact. There’s no flash, no trash-talking about the competition, no boasting. They are exactly what they appear to be. They’re very cautious about pre-announcing anything. They don’t want to set expectations they might not deliver upon. They do not posture themselves as the next greatest entity that will totally disrupt the ERP space. Quite the opposite. The absence of pomposity had me scratching my head. Where is the Silicon Valley bluster, swagger and bravado? A lot was said about digital transformation at this event. 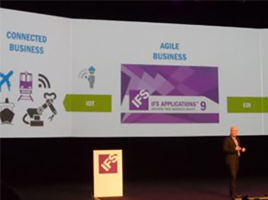 The IFS speakers drilled down to one part of the digital age phenomena: Internet of Things (IoT) and, more specifically, they focused on a subset, the Industrial IoT that focuses on the business-to-business aspects of IoT and not the consumer to business space. The key message IFS speakers were trying to impart was one that manufacturers must improve productivity and add services capabilities to their solutions or face market irrelevance. That is the clarion call for manufacturers to make the switch from old-school Industrial Age businesses and start getting with the demands of the Digital Age. The first step in the journey is for manufacturers to start using the mountains of sensor data their machine tools already produce but in a more meaningful, integrated way. A lot of the focus at this conference was oriented around this first step. I know why IFS chose this narrow IoT path – it’s because it plays to the asset-intensive nature of the business customers they have. If a firm has capital equipment (e.g., stamping machine) that is already wired with sensing devices, for example vibration monitors, movement counts and/or temperature gauges, then the data from those devices can be passed into IFS and displayed/analyzed via IFS tools. IFS does not provide technology that monitors devices nor does it intend to create an IoT platform a la GE’s Predix.Instead, IFS’ solutions kick in once the collected data has been forwarded to its software. use of dark data (data the company already collects but doesn’t use – think of all of those survey or warranty responses that companies collect but seemingly never do anything with!). ERP users have to decide whether they will be incremental digital (lowercase) or bold DIGITAL (uppercase) firms. From the conversations I’ve had, I suspect the firms that are looking at a digital strategy think that the changes will be controllable, slowly evolving and incremental. Others will take a DIGITAL approach and make bold, all-encompassing and transformative changes. Retailers that go slow are already finding that DIGITAL players like Amazon , Alibaba and eBay are eating their lunch. Manufacturers like GE are buying sensor companies, embracing additive manufacturing capability like 3-D printing, and hiring as many data scientists as they can find. These kinds of business are becoming hybrid firms that make many of the same products as before but with each product generating terabytes of data – data that helps them service, maintain and enhance the products they sell. That is their new competitive advantage. Incremental approaches assume that time is always there for companies to take when it suits them. Unfortunately, businesses have never had the luxury of time as innovation and competition set the timetable. Today, the rate of innovation alone is moving at an amazing clip. The time for incremental approaches is nearing its end. 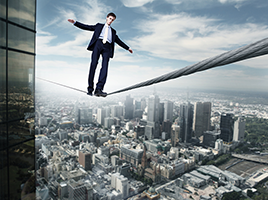 ERP vendors may no longer have the luxury of time either. Creating incremental approaches for their customers’ digital evolution may no longer be viable or market-wise. Some ERP vendors that will argue that they must provide these incremental paths for many of their customers as few firms can execute big bang change. Some old customers can’t make big disruptive changes because they are so far behind in their technology. Customers that still run on-premises solutions instead of multi-tenant cloud solutions are often several versions behind on applying software upgrades, have latency in their systems, lack any real mobile/social solutions, etc. These customers are going to get hurt. No ERP vendor can really help a customer that has chosen to live a negligent technology lifestyle. The best ERP vendors develop solutions for the customers to come, not the ones they already have. If vendors build competitively vibrant and current solutions, a large enough group of existing customers will make the migration. Those that don’t or can’t evolve must not be allowed to become a boat anchor to the ERP vendor or the other customers who are willing to change/grow. The question then comes. can IFS’ customers make the bold digital changes or will they take the piecemeal digital path instead? In the next part of this short series, I look at the technical underpinnings that IFS proposes to its customers.